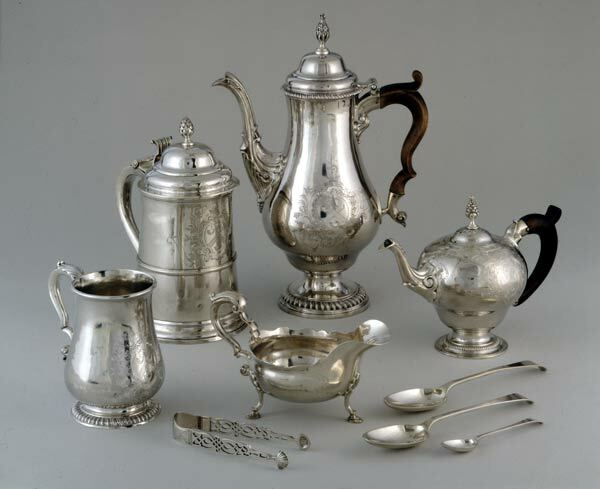 This service, commissioned by Dr. William Paine of Worcester for his bride, Lois Orne, is one of the highest achievements in design and craftsmanship credited to any eighteenth-century New England silversmith. As the centerpieces for the service, the coffeepot and teapot represent a full-blown expression of the graceful, organic Rococo style that became popular in the colonies in the 1750s. Typical are the "double-bellied," gravity-defying forms of the pots, their ornate spouts cast with vigorous C-scrolls and acanthus leaves, the reeded banding of their raised feet, their pineapple finials, and the asymmetrical engraved cartouche representing the coat of arms and crest of the Orne family. The forty-five pieces of flat and hollow ware of the original Paine service, not produced as a matching set, together represent the largest single order recorded in Revere's ledgers. The price he charged for it- £108- was a sum affordable by only the wealthiest patrons.